Adventures of Huckleberry Finn is widely regarded as a classic American novel--a groundbreaking one in which the author attempts to accurately portray society through the use of at-times coarse vernacular English. 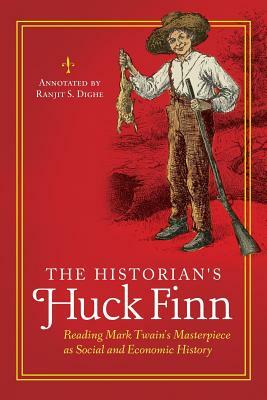 In this book, readers can experience the full text of Twain's Huckleberry Finn accompanied by annotations in footnote form throughout. As a result, this classic is transformed into a fascinating historical documentation of 19th-century American life and society that touches on topics like slavery, the transportation revolution, race, class, and confidence men. Bringing the perspective of a social and economic historian, Ranjit S. Dighe offers more than 150 annotations as well as supporting essays that put the characters, incidents, and settings of the book into their historical context. First-time readers get to experience a great American novel with memorable characters, vivid imagery, and a great narrative voice while simultaneously learning about American history; teachers and students who have read Huckleberry Finn before will enjoy re-reading it, especially with insightful annotations that connect the story to the historical timeline. This book exposes the subtle lessons Twain's tale has to teach us about America's growth, development, conflicts, and mass movements in the nation's first century. Ranjit S. Dighe, PhD, is professor of economics at the State University of New York at Oswego.